You will be prompted by a username/password. Your host's root credentials resp. the credentials of an authorized vCenter user will do the trick. In the case of directly accessing a host these ids are just numbers. If you access a vCenter server then the ids are strings like "vm-number", and unfortunately it is not that easy to find them out. 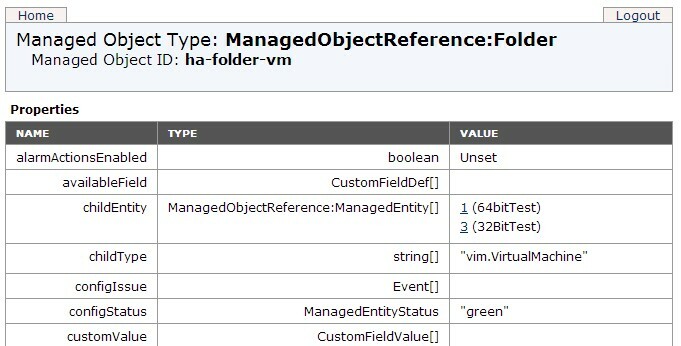 It is still possible though to find the id through vCenter's managed object browser (/mob). This post will give you an idea. When it comes to mobile devices the options to look at (or even control) a VM's console in an affordable way are very limited: In fact the only free option that I can currently think of is VMware WSX - it even allows for controlling the console, and all that from any HTML5 capable browser (that means: even on the iPhone and iPad! ), but it needs an additional machine-in-the-middle (for running WSX) which means it is relatively complex to set up. You are running a Windows VM for offering an important service, but since a recent change this VM tends to crash intermittently with a blue screen. While being on the road you can periodically check with your mobile if the machine has crashed. You are running a lengthy job on the console of a VM (Windows or Linux), and you have no idea when it will finish. Just look at it from time to time, using any accessible Internet browser. One case that happened to myself: I have the OpenSource edition of Zimbra (VMware's Email and collaboration suite) running on a Linux VM in my hosted vSphere lab. After changing an advanced configuration option in the software it suddenly showed a memory leak in some process that brought the server to a grinding halt after some time. To find out when this happened and what process caused the memory leak I ran the top utility on the VM's console and looked at that from time to time. How easy this would have been with the browser trick! If you try this out on your own then you will probably notice that most of the consoles you look at are just completely black. This is because both Windows and Linux OSs blank the console's screen after some timeout. In a physical world this is meant to avoid LCD screen burn-in and save monitor power, but in a virtual world this is just annoying (I even doubt that this will save any CPU cycles). Luckily there are ways to turn off screen blanking. For Windows you need to look at the Power options to do this (also remember to turn off the screen saver in the Display settings). On Linux text consoles e.g. you can do this with the command "setterm -blank 0".